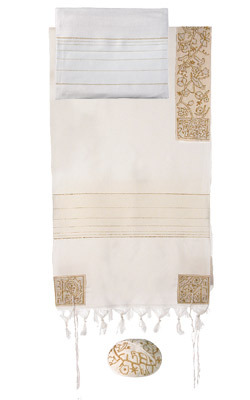 The Matriarchs in Gold Tallit Hand Embroidered Atara and Corners CAT# THE- 7. size: 20” X 75”. made of hand – woven cotton. The motifs are hand – embroidered on a separate piece of raw cotton fabric using various colors of silk, gold and silver threads. In Jewish communities, a tallit is given as a gift by a father to a son, a father-in-law to a son-in-law, or a teacher to a student. It might be purchased to mark a special occasion, such as a wedding or a bar/bat mitzvah. Many parents purchase a tallit for their children at the age of 13, at the same time as they purchase tefillin.